It's Christmas Day (or at least, it was), which calls for a super special recipe. Whilst the rest of the world reaches for the Champagne, I reach for the chemistry kit, and set about creating a cocktail fit for a king. Or all three kings, for that matter. 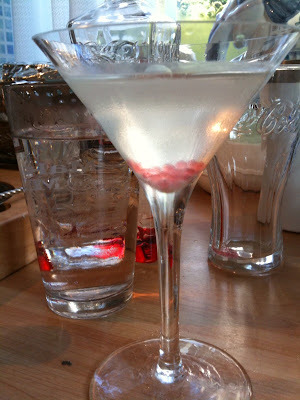 The goal was a fresh, fruity martini, with authentic, natural, and subtle flavouring. To this end, I employed another technique borrowed from the molecular gastronomy cook book: "Sous Vide" cooking. Essentially, this refers to cooking at low temperatures, in a vacuum. For our purposes, this enables infusion of flavours which would normally take weeks (if not months) to be achieved in minutes. To begin, I finely chopped one gala apple and placed it into a sealable sandwich bag. I then poured in 250ml of Beefeater 24, and worked the bubbles out of the bag before sealing. 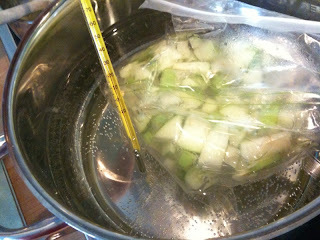 This was then placed into a second bag to prevent any leakage (in either direction), and immersed in a pan of water which I heated to 60 degrees Celsius, and maintained at that temperature for 20 minutes. The result: a naturally apple flavoured gin, which completely avoids any synthetic flavouring, and takes a fraction of the time you would expect for an effective maceration. Next, I made an elderflower caviar using calcium lactate, sodium alginate, and a natural elderflower liqueur (from the Chase Distillery). This was done using the typical spherification method, which I covered in a previous video (here). With both of these steps complete, the preparation was finished. To make the martini, I started by chilling the glass with ice and soda water (which is standard practice for this type of drink). 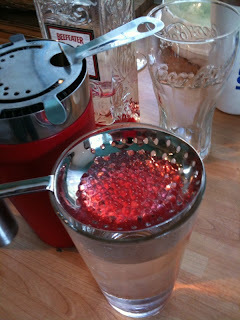 As I wanted very subtle flavour, I opted to shake the apple infused gin over ice, rather than simply stirring. This would increase the dilution of the gin, taking the edge off the abv (a good idea, since I have removed vermouth from this recipe). With the gin well chilled, I double strained the liquid into the martini glass using a hawthorn and julep strainer, to remove any shards of ice from the cocktail. The final step was simply to add the elderflower caviar into the glass using a barspoon, and serve. Served with pan fried scallops lovingly prepared by Mrs Lowe, this cocktail was a real hit. Next time around, I shall infuse an entire bottle of Beefeater 24, and simply re-bottle any left over gin for future use. I particularly enjoy cocktails where a little preparation ahead of time dramatically cuts the time required to make the drink, and so noticeably improves the final product, and this Christmas Martini is a particularly good example of this.